The first artificial lens implant to treat cataracts was carried out in London just over 60 years ago. Pioneered by ophthalmic surgeon Sir Harold Ridley, it was a concept that would go on to save the sight of millions. Now, a groundbreaking new type of lens has been developed that can be adjusted to give a patient perfect vision after it has been inserted into the eye. Made from a unique material, the lens has the ability to change shape when a certain strength of laser light is shone on to it, meaning it can be tailored to an individual patient's needs - whether they have cataracts or are long or short-sighted, or have astigmatism, for example. This is a condition that causes blurred vision due to the front of the eye not being a regular shape. Surgery using the innovative light-adjustable lens (LAL), developed by a US company and a Nobel prize-winning scientist, has been carried out on the first patients in the UK in the past few weeks by consultant ophthalmic surgeon Mr Bobby Qureshi. 'You can virtually promise people who have cataract surgery that they will have perfect vision, whereas before that hasn't been possible,' says Mr Qureshi. 'What's more exciting is that some people may even achieve "super vision", which is better than 20/20 (normal vision). 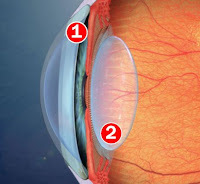 A cataract is the clouding of the lens, the part of the eye that helps focus light on to the retina to form an image. As the lens ages, it starts to turn yellow and cloudy. Light is unable to pass through to the retina and vision becomes blurred. Left untreated, cataracts can lead to blindness. About a third of people in the UK over 65 have cataracts in one or both eyes. Typically, treatment is a replacement lens implant but perfect vision could not be guaranteed - until now. Mr Qureshi, who specialises in cataract surgery and lens implants, explains: 'Cataract surgery is one of the most common surgeries performed worldwide. We do around 300,000 in Britain each year on the NHS alone. 'Ten years ago, multifocal implants came along, offering patients better vision for both near and distance. But many are still left with residual astigmatism and require laser eye surgery, or still need to use glasses. Mr Qureshi says the LAL will also help anyone with presbyopia (age-related long-sightedness) - something that begins around the age of 40 and affects everyone at some point. The procedure can remove the need for glasses altogether. 'Potentially, anyone over 40 who wears glasses could have total freedom from them with this operation and possibly sharper vision than could ever have been achieved before,' says Mr Qureshi. The key with the LAL is the unique materials called 'macromers' embedded in the make-up of the lens. When UV light of a specific wavelength is shone into the eye, they group together, producing a swelling that changes the lens curvature. In other words, the lens can be reshaped precisely for each patient's needs. So far, 1,000 patients have been operated on worldwide and the first cases in the UK were done three weeks ago by Mr Qureshi, who works at the private London Eye Hospital. He performs the procedure - which is carried out under local anaesthetic and takes ten to 15 minutes - by making a 2mm incision in the eye. Through this, the cloudy lens is fragmented using high-frequency ultrasound and is removed through a fine tube. The LAL is rolled up and inserted through the same incision. It unfolds once inside the eye. Mr Qureshi says: 'In just a couple of hours, patients should notice an improvement in their vision - often even better than it was before their eye problems. 1. The 15-minute procedure is carried out under local anaesthetic. A 2mm incision is made in the eye. Through this, the cloudy lens is fragmented using high-frequency ultrasound. This is then removed through a fine tube. 2. The light-adjustable lens (LAL) is rolled up and inserted through the same incision. It unfolds once inside the eye. The next step is the adjustment, which is done ten days to a fortnight after the lens implant. Once Mr Qureshi has evaluated the patient's vision, he or she will be seated with their chin resting on a support, much like during a normal eye test. A sophisticated computer then shines beams of UV light into the eye and on to the lens for about 90 seconds, changing its shape. A few days later, the patient returns for any finetuning, after which, using further beams of light, the LAL is 'locked in' to position. Mr Qureshi says the procedure does not carry significantly more risks than traditional cataract surgery. But because the light can make a patient's eyes susceptible to UV light until the LAL is locked in, they must wear protective glasses. They must also use anti-inflammatory and antibiotic eye drops for four to six weeks. The hope is that the operation will eventually be available on the NHS. In the meantime, it costs about £3,000 privately. Part-time nurse Gill Balfour, 61, from Epsom, Surrey, was one of the first in the UK to have the LAL. For the past ten years she has been wearing glasses or contact lenses to correct presbyopia. 'Mr Qureshi explained all about the LAL and I did my own research. I was really excited about having it done,' she says. Gill opted for blended vision rather than a multifocal lens and had a predominantly distance lens implanted in her left eye about three weeks ago. It has now been locked in. Next week, she will have a predominantly near lens inserted into her right eye. Gill says the vision in her left eye improved dramatically as soon as the lens was inserted. 'I had to wear a protective patch overnight. But as soon as I removed it the following day, I could tell immediately that the vision in that eye was better. Everything was brighter. I suddenly saw the world in a different light. 'Through the new lens, I realised that white looked really white, whereas through my right eye it was slightly yellow. 'Through my left eye, I can now read the smallest line of letters on an eye chart, which is two lines better than normal vision. Before, without glasses or contacts, it would have been a complete blur.